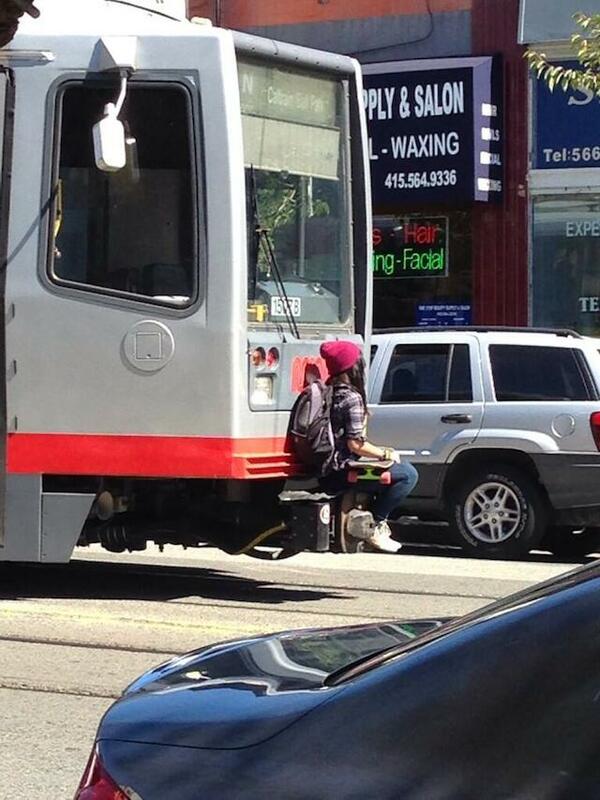 This skater done hitched a ride on a Muni light-rail vehicle. Crazily, this isn’t our first such Muni daredevil sighting: In 2011, we posted about this cyclist who couldn’t be bothered with the Muni right-of-way and the hill it bypasses on the J-Church line. That’s nothing new! Muni Diaries has published a number of people taking their lives into their own hands by riding the coupler. It’s just an updating of the old method of “nipping the fender” (riding the raised device that scoops up fallen pedestrians when lowered on the old-style cars of long-ago).